On National Marquette Day, the No. 10 Marquette Golden Eagles (20-4, 9-2 Big East) narrowly dodged the No. 14 Villanova Wildcats (19-5, 10-1 Big East), 66-65 behind a bounce back effort from Markus Howard with a game-high 38 points. Here are my five takeaways from the Golden Eagles’ win from Fiserv Forum. A season ago, few fans and media members would not have dreamt that Marquette’s defense would make a 360 degree turn. Saturday’s game represented the apex of the defensive improvements as the Golden Eagles set the tone early as they gave the Wildcats fits with seven of their first eight three-point attempts going the wrong way. The poor shooting haunted the Wildcats for the remainder of the half, but stayed within distance for a good portion of the contest despite going 2-of-14 from three-point range in the first 20 minutes. After being held to 17 points, on 5-of-17 shooting against St. John’s on Feb. 5, Howard returned with a vengeance as the junior put on a show in the first half with 21 points. Howard delivered crossover moves that would make Stephen Curry blush as he single-handedly kept Marquette in control of the lead for the majority of the game. The individual stats meant very little to Howard as it was more about the team overcoming a one-point loss to St. John’s on Feb. 5 to being on the other end of a one-point result on Saturday. Phil Booth and Eric Paschall carried the load with 36 of the Wildcats’ 65 points, despite Villanova going 9-of-29 (31 percent) from long range. The pair continued to excel despite a rough start to the second half as Villanova overcame a 15-point deficit to take a 55-53 lead on Jermaine Samuels’ three-pointer. 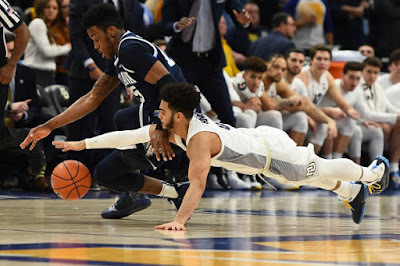 The final five minutes of the game saw multiple lead changes as it came down to the final possession as Booth would be swamped by the Marquette defense under the rim and found Samuels on the left post as he struggled to get a decent look as time expired with the ball nicked off the rim. Marquette coach Steve Wojciechowski saw the win as another sign of emotional maturity as it captured at least 20 wins for the third time in the last five seasons. With Sam and Joey Hauser non-factors for the most part, Sacar Anim stepped up to fill the void with 18 points, on 8-of-10 shooting. 13 of Anim’s 18 points came in the second half as the confidence started to exude on the hardwood. Villanova’s recent dominance of Marquette was potent with nine of the previous 10 wins in the series. The Golden Eagles’ win pulled them to within a game of the Wildcats in the race for the Big East regular season championship and has another meeting at Villanova on Feb. 27. With St. John’s, Georgetown and Butler in a three-way tie for third place behind by four games of Marquette, a two-man race has formed and the final month of the season should provide quality moments on both ends of the spectrum. Welcome to frantic February in the Big East.